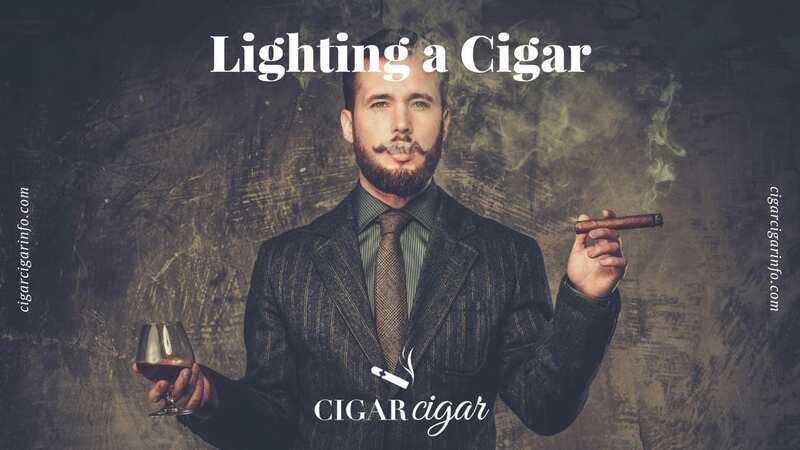 Everything You Need To Know About Lighting A Cigar - Complete Guide! Lighting a cigar-the final step before you can enjoy it. Now that you’ve cut it which method do you use for lighting it. The following post is Cigar Cigars guide on lighting a cigar. Remember a cigar is not at all like a cigarette, you don’t just light it and that’s it. The size of your cigar will determine how long it takes to light properly but even still there is a technique to it. The process of lighting a cigar can be quite long, enjoy each step as your marvel at the craftsmanship of the cigar. These steps are very important, you want to light a cigar properly. If you don’t there will most likely be a lot of smoke which is going to ruin your smoking experience. Ensure you hold the cigar with your index finger and thumb. You want to have the foot which is the furtherest side from the band, in your hand. Hold the cigar at an angle of 80 to 90 degrees to the flame. Ideally, keep roughly 3-4 fingers distance between the foot of the cigar and the flame. You do not want to over toast your cigar by placing it too close to the flame. With the foot near the flame, evenly and slowly rotate your cigar until every part begins to burn. It is crucial to get an even burn happening. It can take some time to light a cigar, do not rush the lighting process. When the foot begins to glow orange you can assume the cigar is burning. Take a puff. Feel free to do that twice, this will ensure the inside of the cigar is burning and it will remain lit for a while longer. You’ll be able to feel the heat on the cigar. Once you have sit back and enjoy your smoking experience. For any aficionados out there, they will not re-light a cigar if it goes out. We don’t follow this rule and re-light it if necessary. Cigar aficionados will place the blame on a cigar extinguishing to poor quality. We believe that until you have mastered the lighting and smoking process, re-light the cigar as many times as you need. Cigars also go out from time to time if they are not continually puffed on. The amount of chemicals present are significantly less than those in a cigarette which is another reason why the tend to go out. Again, feel free to re-light it. Now that your cigar is lit, sit back and enjoy the experience. Take a look at our how to hold a cigar post for what your holding style says about your personality. As we’ve explained in our best cigar lighter post, the best way to light a cigar is with a butane lighter. If you don’t have one there is also the option to use cigar matches which are specific for lighting a cigar. Do not use a candle, a stovetop or the cheap lighters one can purchase at a gas station. This is because the chemicals and fragrances in them will taint the taste of your cigar. Not only this but it will completely change the flavor and aroma of your cigar. For this reason, we only recommend the use of butane gas lighters. If and when using matches, the key part is that you let to match burn a little before putting it to your cigar. This allows for adequate time for the phosphorous and sulfur product to dissipate after striking the match. There are also sulfur less matches that one can buy. A cigar will ash as it burns, do not be concerned as they will fall on their own. If you smoke cigars of high quality chances are the ash will stay on the cigar for a long period of time. For cigar aficionados they will debate that the quality of a cigar can be shown by the length of ash. Now you are familiar with the correct way to light a cigar, it’s time to try it yourself. Follow the 7 steps and enjoy the smoke, flavors and aromas of your cigars.